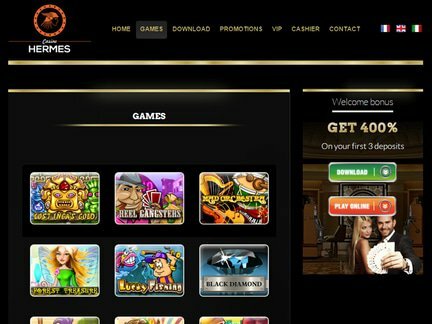 The player who enters the Casino Hermes website may be surprised by the lack of flashy design. The website is incredibly plain. The background is all black. However, the signs on this plain background points to intriguing deals. The welcome bonus is a good example. The deal provides as much as 400 % on the first three deposits. This is an incredible deal, which puts other online casinos to shame. The top customers can also expect to be richly rewarded for their dedication to the online community. The high roller welcome bonus serves as a good example of the royal treatment. A deposit of 500 dollars can be exchanged for a whole lot more play money. In fact, the player can receive 1,500 dollars as part of the deal, which puts the game play amount at 2000 dollars! Some players may opt for a cash back option. No wagering requirement exists for this type of bonus money. The player will simply be credited with a cash back bonus. The balance must reach zero. This is a fantastic option for players who choose to stay away from the welcome bonus. They will automatically receive 50 % cash back on the initial three deposits. If a friend of the player makes a deposit on the site, the referral bonus can also be credited to the referring player's account. Furthermore, the website offers some exclusive VIP bonuses. At this point in time, the Casino Hermes provides Mount Olympus VIP Bonuses. This deal features neat bonuses and all kinds of gifts. Finally, it is important to mention a deal that makes the casino unique, mainly the alternative payment method bonus. A player who does not use the standard credit card in making a deposit can expect to receive an additional 10 % bonus. In terms of the available deposit and withdrawal options, the casino accepts the big credit cards such as; Visa and MasterCard. However, it is also accepts the deposits made through the following services; Neteller, PaySafeCard and Ukash. The security & privacy are treated very seriously by the staff. The player's personal information is locked away using good encryption methods. 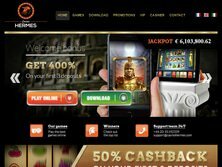 The Casino Hermes website is accessible in English, French and Italian. The players from a specified list of countries may not be able to join the site. The list of highlighted countries would include; Poland, Nigeria, Costa Rica, United States of America, Israel, North Korea and Cuba. Otherwise, the players are free to join the site regardless of location. The casino will be happy to accommodate them. The game offer is not all that impressive, at least in terms of the sheer number of the games. There are very few games that have been highlighted in the "games" section of the website. These games would include; Reel Gangsters, Lost Inca's Gold, Black Diamond, Lucky Fishing, Forest Treasure, Happy Circus, New Tales of Egypt, 7 Bingo Slot, Lotto Mania, Sugar Rush, Treasures of the Pharaohs, Merry Bells, Swipe Roulette and Fruit Slot. Several other games also show up, but it is clearly not a big selection. The customer support service is available via phone, e-mail and live chat. This range of contact options is a definite plus! At the same time, the complaints have not surfaced. In this situation, it is best to be careful without putting one's plans on hold. The casino could be the perfect venue for trying out different games. Casino Hermes is registered under RTT Media Info Ltd. In the United Kingdom. I was disappointed with the game offer. Only a few games could be played at the venue. While some of the games are pretty interesting, I still felt that there was a real lack of choice. On the other hand, I was impressed with the promotional deals on the site. The cash back promotion as well as the VIP bonuses are great! The same can be said about the generous welcome bonus offer. The black page background appeared uninspiring. But maybe I felt that way due to the fact that I am used to seeing colorful and flashy main pages in online casinos. I believe that the casino needs to work on creating a better impression. It should also add more games to its line-up!